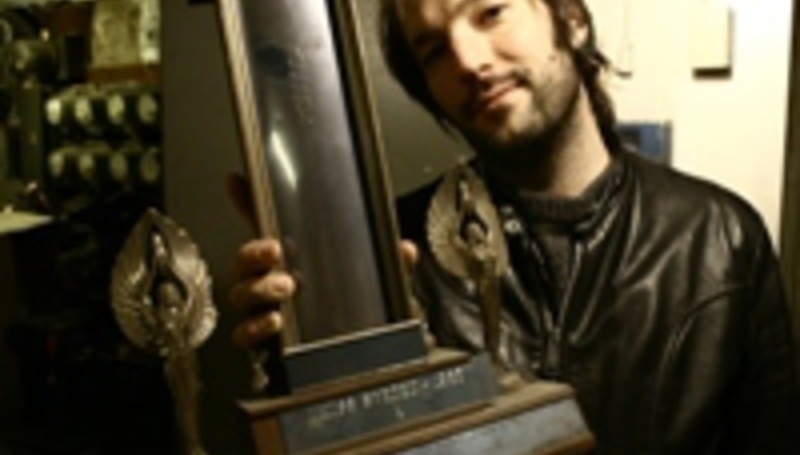 Kelley Stoltz is to release his third album for Sub Pop next month, Circular Sounds. The record – the singer/songwriter’s fifth studio effort proper – features more of Stoltz’s trademark sun-kissed pop harmonies, taking cues from his previous album, the critically lauded Below The Branches (review). Born in Michigan, and later a resident of New York City, Stoltz presently lives in San Francisco; while it’s an assumption to suggest that the weather in California influences his accessible, shimmering ‘60s melodies, it’s a fair observation from a critical angle: this is music that doesn’t offer too much in the way of a challenge. It’s purposefully easy on the ear, like the best classic pop should be. Nice, in the nicest way: far from mundane, and effortlessly enjoyable. Circular Sounds is released in the UK on February 11. Ahead of this date for your diary, DiS caught up with the man himself for a wee bout of Q&A-ing. Circular Sounds is almost upon us – what should fans of previous LP Below The Branches be expecting? Is it more of the same, essentially, or do you feel your songs have developed in any explainable way? The maturity of the melodies, the insightfulness of the lyricism… I don’t know… something that’s intangible, anyway. Well it’s much less about writing on the piano, and more of a guitar based effort. I was hesitant to be thought of as ‘the piano man’, so I think I subconsciously veered away from making up new tunes on piano and adding bits later - which was the case with a lot of songs on Below The Branches. Below The Branches was a critical hit, and one of its tracks founds its way into commercial use (quite literally – oh ha ha ha) – do you see that acting as a springboard to wider recognition with this new LP, or after so many records are you not the sort to take any small thing for granted? Or, even, to pay anticipation or expectation too much heed? It’s my first experience with having songs played on TV, in ads or on shows, so we'll have to see what effect it has on people coming based on a song they heard in an ad. My first tour in the USA is coming this spring with a song in a bank ad - so we'll have to see. The cash has been nice: more sushi, less burritos. Environmental concerns clearly weigh heavy on your mind, at least enough to make a point of recording Below The Branches while monitoring electricity use, et cetera. While this is something clearly more artists should be aware of, why do you think it is that so few care for how much power they’re pumping into their weeks of studio time? Do you have to think carefully about touring overseas, what with the increased publicity regarding carbon footprints? I think that recording a record takes so much thought and time that other details like carbon footprints and electricity use are lost in the shuffle of making sure the artwork looks cool, and the lyrics are spelt right, et cetera. I was lucky to have a good friend who is in the renewables industry who showed me some easy things I could do - otherwise I'd have been clueless about it, too. There is probably still a stigma attached to being environmentally conscious in a way - you gotta be a hippie dude in a jam band to care about those things equally...?! It’s interesting that every interview I did with folks in New Zealand dealt somewhat with the offsetting I did -whereas in other countries – the USA especially - fewer writers bring it up. I think there is now some expectation to ratchet up my commitment - offset plane travel, get a bio-diesel van - and until I'm able to make ends meet monetarily I can only do so much, and as an avid home recorder offsetting the use of my amps and tape machine and computer is the thing I'm able to do most easily while having the most direct effect on what I do. How has signing to Sub Pop improved your fortunes? Would you be were you are – able to tour abroad, release your fifth studio LP – if it wasn’t for their interest and, presumably, investment? Are you pleased with being associated with the label’s roster – not just famous faces past, but recent additions like The Helio Sequence and No Age? It’s been nice having a team of people helping with big and small details. I've made some good friends there, too. It’s also given me a bit of a budget to buy better microphones and be able to afford to go on tours in other countries, where even if the crowds are small I'm not pawning guitars when I get home to make the rent. I’m happy to be on the roster - I really dig Jennifer Gentle, Comets on Fire and I have heard some new acts they've signed who are cool, too. As well as headlining your own dates the world over, you’ve enjoyed a supporting role with The Raconteurs. Did playing these larger venues present any problems, or stimulate any forgotten nerves about playing before a crowd? Do you ever get nervous these days, and if so is it when a room’s super full or worse when a room’s not so rammed? Playing with the Rac’s was fun, seeing how it works behind the scenes of a big tour. You had to be on time and do your thing and let the real show get on with it - we made some fans and got to play in really nice halls. And watching those fellows work up a song in soundcheck and kill it live that night was a real inspiration... I found it easier to play for the bigger crowds, there's a degree of anonymity there that lets you hang loose a bit on stage. I'm much more nervous playing a tune for a couple friends or god forbid the family at holiday gatherings. Related, sort of: I guess you must find certain cities to be good for you when on tour, and others not so. Does this fluctuation ever get you down, or especially perk you up? What places do you find the best crowds in, generally? Cities, countries… I see you’re touring Australia soon (and have released a tour LP recorded there, too) – do you have a particular affinity for the place? My best shows aren’t always where you'd expect, so some nights it’s a bit of a let down when you peek out behind the curtain and there’re 12 people there - but all of a sudden you're in York, not knowing what to expect, and there's 200 people singing you happy birthday. I always love playing in Australia – there’s such a vibrant local scene in Melbourne, and you get great bands on interesting, stylistically varied bills, as well as appreciative crowds. They are quiet on the acoustic tender stuff and loud and fun on the rocker numbers. I Have always enjoyed Glasgow and Rotterdam, too. Assuming – stop me if I shouldn’t – again, but I take it you’ll be playing the UK again soon? Do you generally have a fun time coming over here, weather and food aside? Actually, just why do so many Americans moan about British food? I hope to get over to the UK this summer... As for cuisine, I think it’s the beans, eggs, chips, sausage and repeat every morning that gets folks down. I'm still new enough to touring that it’s a thrill to go to Marks & Spencer on the motorway, just knowing you’re on a tour playing your music in a whole other continent, that I don’t get down on it. Plus, as a lifelong anglophile music fan - Bunnymen, Beatles, Bowie, Kinks and all that – I like getting into the cuisine that made my heroes’ brains run. Food aside: you like coming here? You find receptions to be generally positive? Is it ever tough playing shows on the continent because of the language barrier, or are they just as into it? I love it - I mean, I've sang my songs in Liverpool for God’s sake. If you told me at 12 I'd get to really do that in life I wouldn’t have believed it. The crowds… well, it’s a work in progress. We've had a few good nights and some sad, lonely ones where nobody came and the promoter did a runner. But I’m hopeful. On The continent you really get the royal treatment, nice dinners, insanely nice hotels paid for by the government or somebody - and the shows have been good there attendance wise, maybe more so than in the UK. A typical sign-off question: what’s the rest of 2008, beyond the album’s release, hold in store? Got things neatly mapped out – some shows here, a festival there – or are things still loose? Do you fear the day when touring/recording feels like a chore rather than a joy? I'll be touring the USA with The Dirtbombs this spring, and then I’ll head back to the UK and Europe. After that, who knows? I'd really like to get a new album moving along soon – there’s some good songs done and ready to go, and I’ve gotta write a few more and be done. Hopefully it’ll be done by the end of 2008, or early 2009 - two years is too long between albums and I ain’t getting any younger.